Choosing church pews should start with two numbers: the size of your sanctuary and the number of people in your congregation. 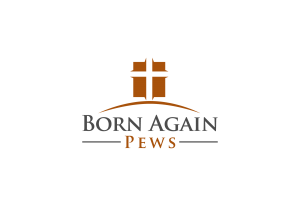 Church pews come in different sizes, and Born Again Pews builds pews to order, so you have many options for how to arrange pews in the space available. You might prefer a single row of long pews, two or three rows of short pews with aisles, or long pews in the center and short pews on the sides. When planning the basic layout, think about how your church uses aisles. The method of collection and communion may rely on aisles. Do your pastors, acolytes, and choirs process into the sanctuary or enter from the robing room? Does your congregation favor formal weddings, or are weddings for non-congregants an important revenue source for your church? These questions will all affect your choice of pew layout. Aisles need to be about a minimum of 4′ wide for people to travel comfortably to their pews or for single-file procession. If you have formal weddings or elaborate processions, you may need 6′ to 8′ instead. Make certain that your aisles are accessible to wheelchairs and walkers. 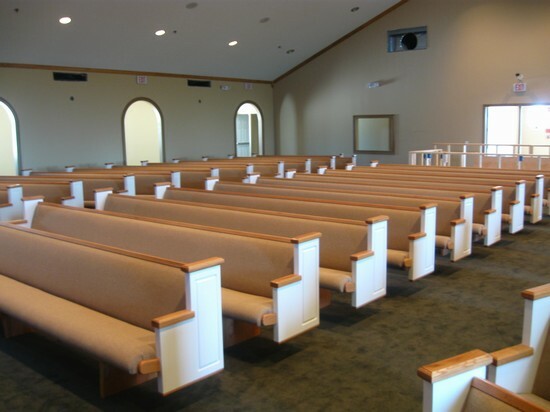 Pews should be about 36″ apart from front to back, unless you use kneelers. If the congregation will kneel during the service, more space will be needed between the pews. As a rule, no more than 14 or 15 people should be in a single pew. Traditionally, a space of about 18″ per person is planned, but this may not be realistic for your particular congregation. Do you have lots of small children? Are members of your congregation comfortable sitting close together? Does the congregation rise and site many times during a service? Do you have elderly people who may need more space in order to stand? Observe your congregation through a few services; you may actually need 21″ or so per person in your pews. If you have a choir, you’ll also need to take into account the fact that choirs are often seated by voice: soprano, alto, base, and tenor are often seated separately. Even if you have a very small choir, your choristers may sit with women on one row and men on another. Choirs may also need extra space for music or for percussion instruments. Large or small, your choir will probably need more space per person than your congregation. Finally, this is the time to let everyone air their pet peeves. If you’re replacing your current pews, you will want to hear that it’s hard for ushers to get through the space on the side or that the praise band needs a place to sit during the message. Your pews should enhance worship, not distract worshippers.